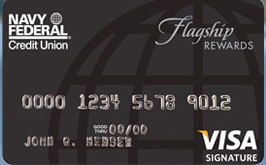 The Navy Federal Flagship Visa card is a valuable and often overlooked credit card. Although it comes with a relatively pedestrian earning rate of 2 points per dollar spent, a low APR, and no foreign transaction fees. The latter is a valuable benefit for a low annual fee of $49/year. Points can be redeemed for gift cards, airfare, travel, etc. If you are interested you can apply here. Unfortunately this is where the card fall short. Navy Federal Rewards redemption options are a poor value to put it mildly. Sure, you earn 2 points per $1 spent, but check out these two redemption examples. The first example is a $50 reward card, which costs 10,000 points to get. That’s a value of 0.5 cents per point! This means that at a 2 points per $1 earning rate, you are really only getting 1% cash back if you choose to redeem your points for a Navy Federal Visa Awards Card. I did choose the cheapest and worst redemption rate. In fact, if you redeem your points for a higher value card, your points do increase in value. For instance, the largest denomination card of $500 costs a more reasonable 69,000 points, which is a redemption value of 0.72 cents per point. Not quite as bad. Still, you could do better than 1.44% cash back, and even with a no annual fee card like the Chase Freedom Card. Let’s take a look at a second example. 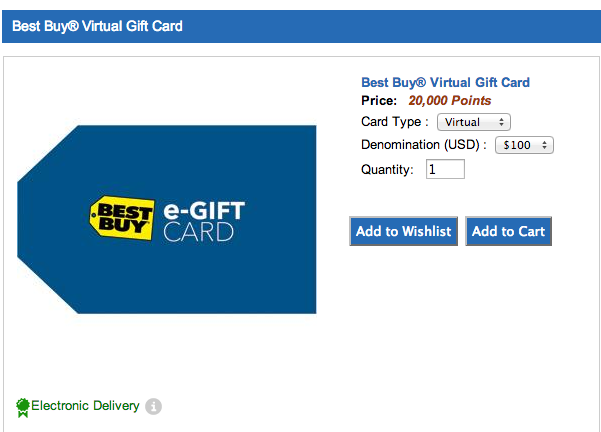 If you chose to redeem your Flagship Rewards points for a Best Buy card it would cost you 20,000 points for a $100 Best Buy Virtual Gift Card. Again, this results in 0.5 cents/point redemption value, and a 1% cash back rate. Not good. It’s cool that Navy Federal Credit Union does allow you to buy a virtual gift card, which is delivered electronically, something most banks like Chase and Citibank don’t allow you to do, but still this is a horrible use of your rewards points. Fortunately flight or airfare redemptions are valued at 1 cent/point. The great thing about how Navy Federal has implemented their flight search tool is that they will let you pay in cash for the remaining portion of the fare if you don’t have enough points in your account. It seems that redeeming your Navy Federal rewards points for airfare is probably your best and I would say only redemption option. 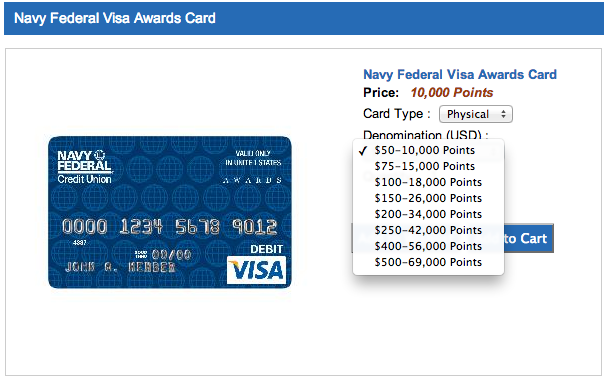 The Navy Federal Flagship Rewards Visa Card is a decent card earning you up to 2% cash back if you redeem your points for airfare. It also comes with no foreign transaction fees, and a low APR. However, do these features justify a $49 annual fee? I think not.